When could $100 million possibly be disappointing? When, and perhaps only when, you’re talking about one of the biggest blockbuster franchises of all time. Solo, Disney’s attempt to engineer an origin story for the most devil-may-care smuggler in the galaxy far, far away, predictably topped the box office this Memorial Day weekend. But it did so with a four-day tally of “only” $103 million—the kind of cash almost any movie would be lucky to make, but a bit soft for a Star Wars story in 2018. 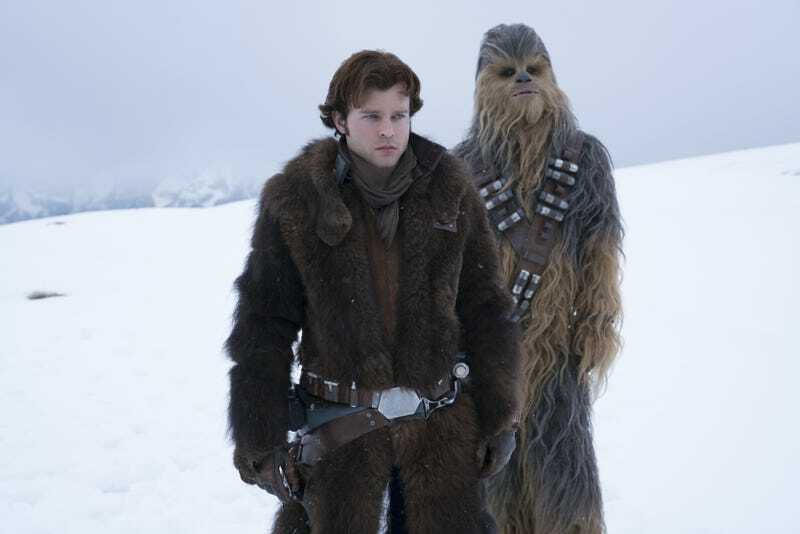 Even when counting Monday (it made $84 million between Thursday and Sunday night), Solo opened weaker than the last four entries in the series, including the 13-year-old Revenge Of The Sith. And it made way less than The Last Jedi did in its first weekend just five months ago. The think pieces have already started rolling in, all speculating about why Solo isn’t doing as well as Disney hoped/expected. (Projections of a debut in the $155 million Rogue One range were apparently wildly optimistic.) Are we seeing the first signs of Star Wars fatigue, what with less than half a year separating this prequel from the last official episode? Oversaturation hasn’t hurt Marvel’s returns, though maybe audiences just think of Star Wars as more of a special cultural event than a regular appointment. Did diehards still bent out of shape about The Last Jedi’s subversion of franchise expectations actually boycott the new film? It’s possible, but Solo is basically the anti-Last Jedi, so devoted to canon that it plays like the exact kind of fan service that Rian Johnson purposefully avoided. Maybe the multiplex is just too crowded with blockbuster options right now; the $55 million second-place finisher Deadpool 2 made in its second weekend—and the $21 million third-place finisher Infinity War made in its fifth—almost certainly put a dent in Solo’s debut. Some seem to think that the film’s production woes may have hurt attendance, but that’s putting a lot of stock in the idea that the average moviegoer cares as much as entertainment journalists do about behind-the-scenes troubles. The good news for Disney is that rival studios were so spooked by the mere presence of a new Star Wars movie that they’ve given Solo quite the runway: No major studio films are opening this week, and the only remotely formidable competition next week is Ocean’s 8. After that, it’s another week until The Incredibles 2 comes along to steal away the family demographic, and one more week until Jurassic World: Fallen Kingdom offers anything resembling a competing giant blockbuster event. In other words, Solo could still save some box-office face. $100 million may a relatively disappointing bow for any entry in this revived series, but there are worse head starts than one that puts you over the nine-digit line in just four days.